If you love chocolate as much as I do you will want to make this decadent flourless dark chocolate cake. 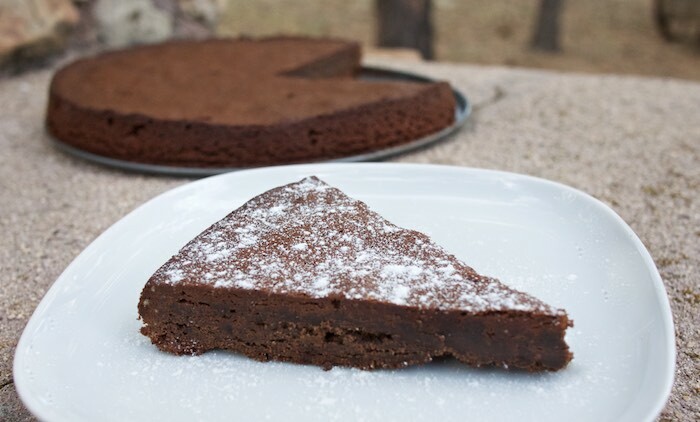 Enhanced with toasted walnuts and a hint of rum this rich cake is guaranteed to satisfy all your chocolate cravings. Special thanks to Imperial Sugar for sponsoring this post and to The PinterTest Kitchen for all their hard work putting #choctoberfest2016 together. Preheat the oven to 350°F and position a rack in the center. Lightly grease a 9-inch springform pan. Place the walnuts in a food processor with the cocoa powder and pulse until the nuts are finely ground. Melt the chocolate and butter together in a double broiler until melted. Allow to cool. In an mixer fitted with the paddle attachment, beat the egg yolks with the brown sugar on medium speed until very thick and pale in color, about 3 minutes. Add the rum and the ½ teaspoon salt. Fold the egg mixture into the cooled chocolate mixture. Immediately fold in the walnuts and cocoa. Place the egg whites and a pinch of salt in a cleaned bowl and, using the whisk attachment of your mixer, beat on medium speed until the whites are thick, about 2 minutes. Continue beating while you gradually add the sugar, then switch to high speed, beating the whites until they form soft peaks, about 1 minute. Fold the whites into the batter, then pour the batter into the prepared pan, smoothing the surface with a spatula. Bake the cake for 40 minutes, rotating halfway through. Allow the cake to cool in the pan for 20 minutes, then remove the sides of the pan and cool the cake completely; the center may sink a bit. Carefully remove the bottom of the springform pan and transfer the cake to a serving plate. Dust with powdered sugar.